This is an excellent case lube. It is extremely easy to apply and it works very well with my LEE press. One the brass is coated with the lube, the the brass resizing exercise is smooth and precise, even if the lube is dry. Excelente produto. Estou 100% satisfeito. DDA qualidade e excelencia no que faz. I have not been desappointed by this purchase. It is fantastic for reloading with my old reloading dies (.45 ACP and .357 mag) Cases are clean and slippery! Easy and Clean... reloading cases is becoming a pleasure! I do not know how I reload all these years without it. Excellent product! 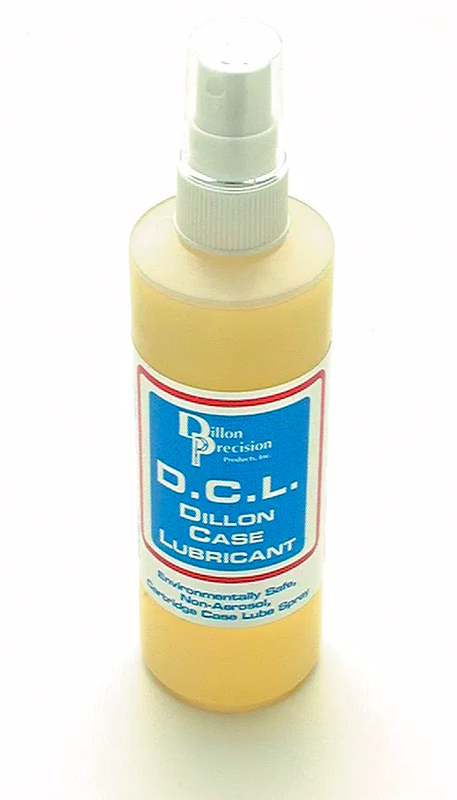 Dillon Precision Case Lube - 8 oz. Home Reloading Dillon Precision Case Preparation Dillon Case Lube - 8 oz. Rapid Lube 5000, Dillon’s aerosol cartridge case lubricant, has been replaced by an “environmentally correct,” non-aerosol case lube. It works the same: Simply lay your cases out, spray lightly with one or two passes and you’ve done it. No mess, no guesswork. Within minutes the lubricant distributes itself around the cartridge cases and you’re ready to load. Try a bottle. You’ll never use a grease pad again. A common misconception among reloaders is: If you’re using carbide dies, you don’t have to lube your cases. Technically, this may be true, but trust us – you definitely want to lube your cases. Not only does lubing the cases make the machine cycle easier and run smoother, resulting in less wear on the machine (and your arm), but you’ll load appreciably faster. (Up to 200 rounds/hour faster on a 1050.) We use case lube for the speed, and as you probably guessed, if it didn’t help to load faster, I wouldn’t use it.